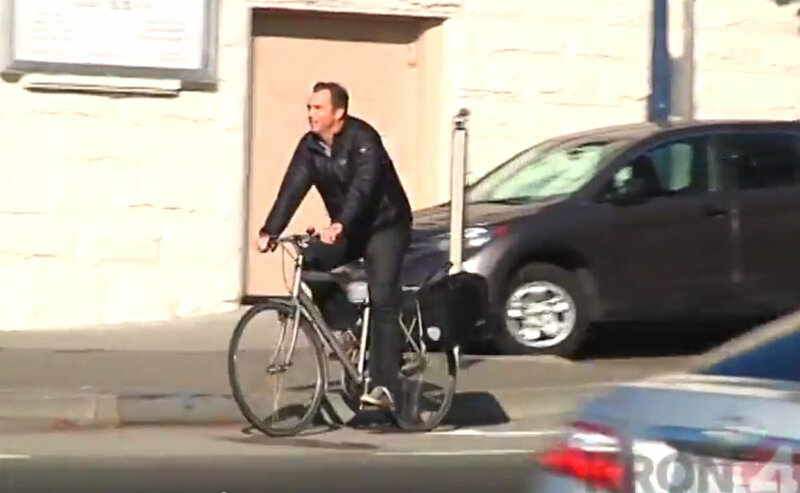 Police were seen ticketing people on bikes navigating a poorly-designed junction at the dangerous Market Street and Octavia Boulevard intersection yesterday in the latest “People Behaving Badly” segment from KRON 4’s Stanley Roberts. The bike lane’s design is so flawed, in fact, that the only bike commuter Roberts showed navigating it properly happened to be one of the city planners leading its redesign (and, no doubt, has paid closer attention to it than most people). The junction in question has a path for bicycle riders headed southbound on Octavia as they prepare to make a left turn on Market. People must skillfully maneuver through a curved bike lane that runs between curbs through a traffic island, thrusting them alongside freeway traffic. When they reach the other side of the intersection, the path to the Market bike lane is blocked by a barrier installed to prevent drivers from making illegal right turns on to the freeway — the real danger at the intersection. “It’s a sharp left turn coming downhill,” said Hrushowy. “It’s awkward — you have to really slow down, swing out wide to your right and come in, then make sure you swing back to your right” to avoid running into drivers accelerating toward the Central Freeway on-ramp. The more commonly-chosen alternative is to stay in the traffic lane and cross a stop sign, then roll through the crosswalk slowly. Though this maneuver is precipitated by poor design, it was targeted by police. And while it may be annoying for people on foot, it’s not what has caused the intersection to see more injuries to people walking and biking than any other intersection in the city in recent years. Under the two-year-old “Focus on the Five” campaign and Vision Zero, the SFPD has vowed to focus its limited traffic enforcement resources on the top five causes of traffic injuries at the most dangerous intersections. But only Richmond Station has followed through, and SFPD’s new traffic company commander has seemed hesitant to meet the campaign’s goals. The actual causes of crashes at Market and Octavia seem to be illegal turns and speeding by drivers, lured by the freeway ramp that was placed there in 2005. In 2013, safe streets advocate Kenneth Goodwin was killed by a driver entering the on-ramp as he crossed in his motorized wheelchair, which was seen sitting several dozen feet south of the intersection on the freeway ramp after the crash. Most of the 30 crashes between 2009 and 2011 were caused by drivers illegally turning right from Market on to the on-ramp, according to the SFMTA’s 2012 Collisions Report [PDF], the most recent one available. Drivers making illegal turns across the bike lane have hit bike commuters including John Billovits — another city planner, who fought against the freeway’s touchdown at Market when it was planned. Illegal right turns may have been reduced since an enforcement camera was installed in 2013, after a decade of efforts by safe streets advocates and city agencies to make the intersection safer. State legislation passed after a long-fought battle to legalize that camera — and only that camera — when concrete barriers, posts, and signage failed to prevent drivers from making the turn. 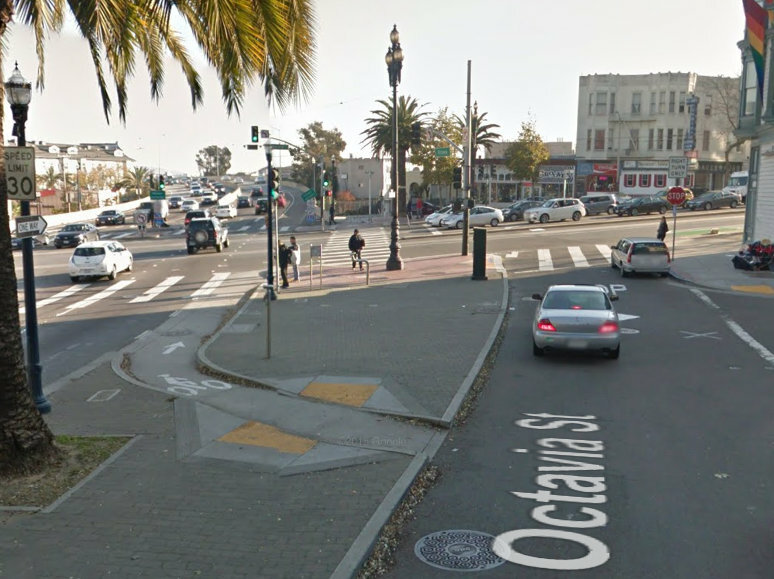 In 2009, a judge stopped the SFMTA from removing the Market bike lane at Octavia. A redesign of all four corners of Market and Octavia could start construction as early as 2016, Hrushowy said. The designs are being finalized, and the flawed cut-through bike lane would be replaced by a bike lane along the left of the traffic lane. Part of Market’s median barrier would be cleared for bicyclists to reach the bike lane headed toward downtown. “It allows people to do what they want to do, which is what they were getting tickets for,” said Hrushowy. Currently, planners are negotiating construction for the project with Muni since the F-Line streetcars would have to be substituted by buses in the process. Roberts told Streetsblog that most of the tickets issued to bike commuters yesterday were for rolling through the stop sign, which is meant for right turns on to Market, to cross the intersection as they avoided the flawed cut-through bike lane. As we’ve written, the stop sign law in every state but Idaho is also fundamentally flawed — it assumes that bikes are just like cars, and creates the unrealistic expectation that someone on a bike should make a full stop at every stop sign, even when there are plainly no cars or pedestrians nearby. Even SFPD officers on bikes roll through stop signs. Roberts’ segment did also show police citing drivers using their phones, applying make-up, and violating the red right-turn arrow while coming from the freeway on-ramp. When I told Roberts that his model cyclist was a city planner who was redesigning the intersection because it’s so flawed, he said he doesn’t buy the idea that better street design can prevent bad behavior. It’s his job to create news segments that shame bad behavior — bad infrastructure and questionable traffic laws be damned.